Growing Oregano in Hydroponics? Read This First! Oregano is a small, bushy herb with a strong unique flavor that’s especially pungent when the herb is fresh. The leaves are used fresh and dried in most types of cuisine, but especially Italian and French. Oregano is sometimes confused with marjoram, which is a similar but separate herb. Italian oregano is a hybrid of marjoram, however. Each oregano has slightly a different flavor which varies even more based on conditions, but all are similar in their preferences. Oregano has small, rounded leaves that are fuzzy in some species—this makes it harder for them to deal with high humidity. You can buy oregano in bulk for $60–65/lb, which ends up being about $4/oz. Dried oregano is $2.50—4.00/oz and dried organic oregano comes in higher at $5–5.50/oz. Fresh oregano pricing varies by market and grower, but Upstart Farmers can consistently receive at least $2–3/oz for herbs. Because oregano is a popular herb, demand isn’t difficult to secure. Be sure to check in with your local markets, however; your crop choices should heavily depend on real-life feedback that is specific to your situation. Oregano can bring in a lot of profit, but be aware that the growing timeline is much longer. Oregano is a slow grower—the first harvest is 8 weeks after transplant. Once established, the tips can be harvested every 3 or 4 weeks. In difficulty, oregano ranks with other woody herbs like basil, rosemary, and thyme. It takes a bit more care than one-harvest crops like lettuce, needs dry periods in irrigation, and thoughtful pruning. Personally, I think of oregano like the caviar of herbs; it’s incredibly tasty, often gets higher pricing, and it’s worth the work. Once harvested, fresh oregano sprigs have a shelf-life of 1–3 weeks. Be careful of over-chilling or excessive moisture on the foliage. Upstart Farmers like Haydn Christensen at Bayberry Fresh are packaging their oregano in clamshells for sale at grocery stores and farmer’s markets. Oregano suffers from typical greenhouse pests like thrips, whiteflies, and sometimes aphids. Keep your IPM strategy up to date and keep an eye out for signs like brown spots, yellowing, and wilting. Be especially aware of overwatering: like rosemary, oregano prefers low watering and is susceptible to root rot and other diseases if kept too wet. Oregano can be started from seed, but you can both shorten timelines and achieve more consistent tastes if you propagate oregano from cuttings instead. Use a rooting hormone (you can buy this at any store with garden supplies) and a substrate with good water-holding capacity; rockwool or peat work great. Cut sprigs from an oregano plant, wet the ends, and dip them into the hormone powder. Wrap the dusted sprig in the substrate. When 5–10 roots are sprouting from the sprig, it’s ready for transplant. This could take up to 6 weeks. Once transplanted, oregano typically takes about 8 weeks to mature and be ready to harvest. After that, it can be harvested in 3–4 week turns. Harvest the tips of the branches during the cool part of the day and take only about a third of the plant, leaving the rest for it to photosynthesize and regrow. 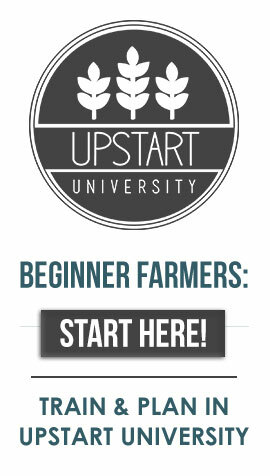 If you’re a new farmer, you’re probably familiar with the question “what’s next?” Learning to build, fund, and manage a farm is a big undertaking, which is why we created Upstart University. This site is dedicated to guiding new farmers on their journey—with the courses they need and at the pace they need. That int’ghsis perfect for what I need. Thanks! Hi. I’m having trouble with my hydroponic oregano. I’m using a hybrid wicking/water culture system and am keeping my PH between 6 and 6.5 and the EC around 1.0 (I realize that this is a bit low, but it’s sharing the bath with other plants that want a lower EC). The plant receives indirect sunlight half the day in a window sill, and I also have a 12W LED grow light set a foot above the plant that runs 14 hours per day. Unfortunately, the leaves are turning brown and dying. The number of brown/dead leaves is slowly increasing, I’ve lost about 20% of the leaves so far. Does anyone have any suggestions? Thanks. Hi JB, oregano like dry periods. Is it possible you’re giving it too much water? I have tried oregano multiple times and failed, using rockwool as a medium. Based on Amy’s comment, could using a clay based medium (eg hydroton) work better?